In July 2007 a law took effect that mandated the cable industry move to a method of conditional access, or content security that was open to users selecting their own tuners, while still being protective of premium content like HBO. This technology is known as cable card where a small PC-Card (formerly known as PCMCIA) form factor descrambler can be installed into your late model LCD or Plasma screen, digital video recorder (DVR), or even some new Vista Media Center PCs, and eventually accessory PC cable QAM tuners. Cable TV subscribers need only call their operator to get for free, or a low monthly fee, a cable card for their chosen tuner. Currently, as this is a new technology, these cards are installed via a truck roll from your cable company, at a cost that you can frequently have waived. In the near future I expect this to be self-installed like DSL as the process is extremely straightforward. Cable companies today do not have their customer service representatives trained yet on this new activation process, as their legacy set top boxes are installed by technicians as well. Because of this government mandated user empowerment, the newly released TiVo HD looks like it is going to replace my Mac Mini running XP Media Center Edition 2005 via Boot Camp with tuning via a Silicon Dust dual QAM tuner in the living room. The reason? It's cheaper than my Mac configuration, it's way easy, and it always works. You can pick up a TiVo HD for about $250 delivered depending on tax from Amazon; which supports dual tuners and can pull in all encrypted digital cable channels, except the on-demand programming. Best of all, thanks to cable-card for conditional access, and the M-Card supporting multiple streams, a single coax cable plugged into the TiVo; along with a single M-card unlocks both internal high-definition tuners. My favorite model of TiVo before this, the DirecTiVo supported two tuners as well, but required two coax lines feeding it from the satellite, a difficult installation proposition for most users. The TiVo HD also has the ability to record from two ATSC UHF HDTV digital signals through a second airial port, so you can stay away from cable fees, enjoying great HD content from over the air (OTA) reception. The internal 160GB drive is a little small; supporting 20 hours of HD content and 184 hours of SD content (at the High quality setting) but rumor has it that TiVo will be releasing software to enable the external hard disk eSATA port for expansion plus the ability for the home media option to work as well - giving bi-directional content sharing with PCs. With that "open" access to additional content, we will have a winner on our hands. I have already seen two updates on my unit, one to fix macroblocking problems that some users experienced and a second that enables more sophisticated "Universal Swivel Search" which searches not only the program guide information within TiVo, but also new movie releases and Amazon Unbox content - which can be delivered to the TiVo from the living room user interface! Take that AppleTV! Now if you are lucky enough to find or have a TiVo activated back then, that unit's lifetime cost you between $199 and $249. At $16.95 per month, it seems to be a good deal, with a quick 1-year payback, considering you got your "lifetime's worth" on your original TiVo hardware. If you add the TiVo HD on as a second receiver however, and go with a 3 year commitment on your HD box, the monthly payment is only $6.95 per month, which means 29 months to equal $199. This means a two-and-a-half year payback of the transfer fee. If you buy a lifetime box off of eBay, which are available yet carry a premium (note, do NOT buy a "LifeTime DirecTiVo" box as MANY are hacked via software and are not elidigable due to these boxes receiving their program guide from the DirecTV satellite stream) consider the additional preium to pay back your investment versus $16.95 per month. By the way, you can find Lifetime subscription "cards" from retail stores that were once sold on eBay too, but they go for around $600. Yikes! 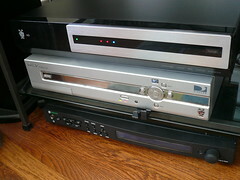 I am a huge fan of the TiVo interface, and with the features of the HD like simultaneous digital and analog output (some early receivers only allowed digital or analog via a switch) so I can run my HDMI TV and Slingbox Pro simultaneously and not be stuck with a cable provider user interface. This does come at a time when Comcast is slowing rolling the TiVo user interface out to its subscribers on a market by market basis. This at a premium cost over their plain vanilla DVR hardware from Motorola. By the way, users who said the TiVo HD interface was slow may have been talking about its operating during initial setup, as the box was parsing its data files. I have had nearly every TiVo, from Series 1 @ 30GB, Series 2 with 120GB and a DVD burner (a favorite for making DVD's faster than real-time) the DirecTiVo with integrated Dual Tuners for DirecTV and finally the TiVo HD. All have what I feel to be some un-necessary lag during operations that could be performed in the back ground (like re-prioritizing season passes) but overall this new TiVo HD performs better or as well as my other units. TiVo, thanks for putting Multi-Stream M-Card support on the TiVo HD box, versus the single stream S-Card on the Series 3 TiVo, which would require a second card and additional monthly charge in my Comcast territory. You've come up with a great product at a decent price. And Amazon has it for $244 now! Oh, and when you activate your service, tell them tivo at davemathews.com referred you!